A key success factor for any CRM or or sales force automation (SFA) project is making sure to plan out the project ahead of time. This chapter explains the requirements, schedules and costs that are involved in completing a Salesforce.com project successfully. the project ahead of time. This chapter explains the requirements, schedules, and costs that are involved in completing a Salesforce.com project successfully. A truly effective Salesforce.com (SFDC) system can dramatically improve your business results in terms of customer satisfaction, executive decision making, smooth partner/channel interactions, and, of course, sales. But the benefits of increased visibility, streamlined operations, and faster cash-to-cash cycles are anything but automatic. The whole reason for this book is to guide you through a series of choices and actions to get you the best results with the least amount of cost, delay, and risk. One of the key success factors in any sales force automation and customer relationship management (SFA/CRM) project is strong executive sponsorship that propels the implementation team and the end users. You'll want to check out Chapter 6 to learn about the best sponsors for your company's situation—but here we'll assume that you already have an executive with fire in his or her belly. Excerpted from "Salesforce.com Secrets of Success: Best Practices for Growth and Profitability" by David Taber. Published by Prentice Hall. Peter Drucker wrote that the most important part of solving a business problem is a wellformed question. The same is true here: the best way to achieve results quickly is to clearly articulate and prioritize goals. This chapter focuses on understanding the requirements, schedules, and costs that are involved in completing any SFDC project successfully. You'll want to make sure the entire team understands the business drivers and the tradeoffs that will shape your SFDC implementation, its integration with surrounding systems, and the instantiation of business processes that will streamline the way your business runs. Salesforce provides a large number of helpful roadmaps, white papers, guidelines, and tips for implementation projects. This book builds on those basics, so you'll definitely want to access the Help & Training system inside SFDC itself, and read up on the materials in Salesforce's main Web site, Successforce, its community site, and user-group sites. Check out www.SFDC-secrets.com for even more resources. SFA/CRM applications are designed to improve the speed of acquiring new customers and to achieve the highest amount of revenue or profits from accounts, thereby raising the customer lifetime value. Before you start detailed planning for any SFA/CRM project, you need to develop a model for how your organization works, showing the basic organizational ownership for each stage of the customer cycle. Figure 1-1 depicts the customer cycle, showing how a company converts the initial investment in marketing and sales to a completed, invoiced order. 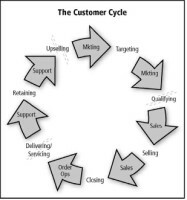 In developing the customer cycle for your company, you'll need to identify which groups are responsible for each of these stages. Make sure the relevant groups have basic agreement on "who does what" to double-check your model. Note the dashed lines at the qualifying, delivering/servicing, and upselling stages: these lines are meant to indicate where the current customer cycle "breaks"—where conversion or retention ratios tend to be too low, or where organizations squabble and opportunities fall through the cracks. It is very common to have breakage points in these three stages, but every organization is different and you should identify the perceived breakage points for your organization as early as possible in the project. The right-hand side of the customer cycle is the sales cycle, in which sales and marketing activities generate all your company's revenues. Because the sales cycle is the principal domain of an SFA/CRM system like SFDC, you'll need to have a detailed model of what the sales cycle stages are, who "owns" them, how long they take, and what the conversion ratios at each step are expected to be. 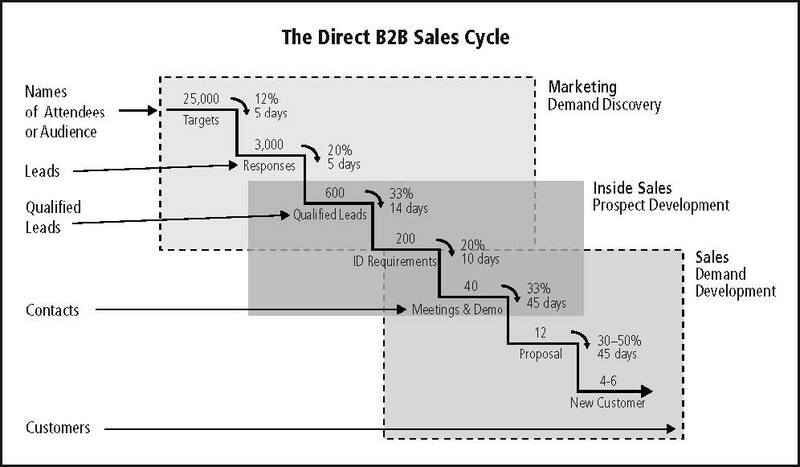 Figure 1-2 illustrate an example sales cycle for a business-to-business (B2B) direct sales operation. 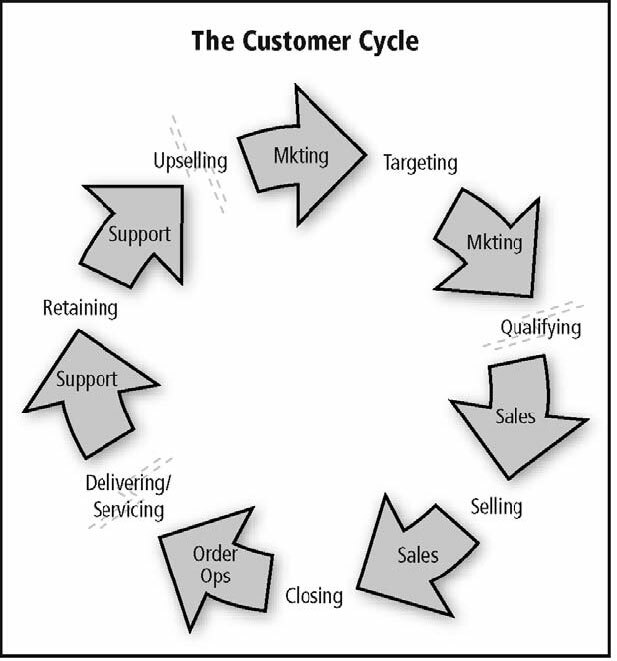 The sales cycle may be viewed as a "waterfall" showing the conversion steps for each stage of the cycle. The diagram shows who owns each stage, what the expected conversion ratios are, and how much time each stage takes. Make sure that both sales and marketing executives concur with the basic data and relationships within this waterfall early in the project. Find out which stages represent the biggest problems and where the executives believe the SFA/CRM can help them the most. Of course, you can't have everything. Keep the list as short as politically feasible. But no matter how many metrics there are, upper management must prioritize them. These figures of merit will be important touchstones for prioritizing the features and process changes that will be done in the course of the SFDC implementation. To make the business case for the SFDC project, you'll need to identify and prioritize requirements at an overview level. Even though the details of many individual requirements can't be known until several weeks or even months after the project go-ahead, you will need to have enough information to scope the cost and assess the benefits. You can't sell the project to management without identifying specific, concrete pain points and potential advantages. The first step in requirements setting is to identify who will (and who won't) need to use the future SFDC system. It's easy to say "everybody," but that decision can mean big implementation, training, and ongoing costs. Worse, it means trying to make "everybody" happy, even if those people aren't critical users. In most companies, only a few departments directly touch the customer every day, so many people won't need direct access to the SFDC system. It's far better to have a narrow list of users, at least initially. Create a spreadsheet with a list of user names, including the user's organization, job title, location, contact information, and expected SFDC interactions. From this list of users, group together the people who are expected to have similar SFDC interactions. Each of these types of user represents an actor (sometimes called a persona) in the system. For each of these archetypal actors, create a one-page description that provides overview information about them: location, educational level, job title, job responsibilities, preferences, habits, language, and so on. Almost any SFDC implementation will involve at least four actors, but this number will multiply quickly in large companies. To keep the number of actors to a reasonable level (more than 10 can be unmanageable), you'll probably need to generalize across similar actors. Descriptions of actors should cover their general role and goals in using the system: how often (and how long) they are expected to be on the system, what they are trying to achieve, which parts of the system they use, what they need to avoid, and what they expect in terms of usability (for example, users might need to do their job on a laptop while they're on the road). Later in the project, team members will want to interview representative actors to get detailed requirements and feedback on the system. For now, however, these one-page summaries help provide some reality and context to the planning process. It's a good idea to give each actor a nickname and include a small photo on the description page to make the user seem more real. Log on to the Salesforce.com Secrets of Success book Web site (www.SFDC-secrets.com) to download a template Actor document. Going beyond the list of people who will actually touch the system, it's important to create a list of people who will have an indirect dependence on the system. These individuals may never log in, but they will depend on some report or data flow that comes from the system. You don't really need to create a full persona description for these individuals (or roles), but it is important to understand which requirements they have for the system (e.g., a distribution center manager who might need the system to be fully operational on Saturdays, even if no users are logged in it). Do You Need to Call in Outside Help? This chapter assumes that the reader is part of a team that will be doing the project on their own. Many companies choose this path, but you should consider whether you need advisory help early on to prepare the business case, prioritize requirements, understand the implications of alternatives, and give guidance. The right advisor can save your company a bunch of time and money by avoiding blind alleys. What are your competitors doing with SFA and CRM? What's the customer expecting in this area? Which departments should be using the SFA/CRM system, and which ones really shouldn't? What are the high-payoff business processes to streamline, and which should be left alone (see Chapter 8 for more on this topic)? Should you try to enhance your existing SFA/CRM system, or should you do a wholesale replacement of it? What are the quantitative payoffs for your industry peers of a solid SFA/CRM system? What are the lessons learned and pitfalls to avoid in SFA/CRM projects for a company like yours? Before you engage an outside consultant, check with the members of your own information technology (IT) team. They may have a list of preferred vendors and, at the very least, can help screen consultants for competence and value. Get management involved early in the decisions regarding "how far do we want to go"—not the detailed requirements, but the general objective. Identify the executive champion, and engage that person in the process (see Chapters 4 and 5 for more on this topic).Use the SFA Maturity Model™ Level descriptions from Chapter 5 to guide this decision, which will provide an overall "scoping" of the project investment. Also go through the SFA Maturity Model questions in Chapter 5 to understand your organizational readiness, and note which actors are part of particularly advanced or immature organizations. In your project planning, avoid over-reaching! It kills both budgets and the likelihood of project success. Once the objective and the actors are settled, identify the scenarios (also called use cases or user stories) for each of the ways the actors will use SFDC. For example, actors in order operations will be entering and reviewing orders all day long, but they may also need to approve exceptional discounts or other special cases every day or so. Given that this approval process involves different thinking and actions from ordinary orders, approvals must be described in a different scenario. The same person may need to do sales forecast reports to support executives, again requiring a different scenario. These scenario write-ups should briefly describe what the actors are trying to achieve, the data they need to see and modify, the approvals they need to proceed, and the other actors or business processes they need to interact with. Make sure to note whether the scenario requires direct access to the system, or whether the situation could be handled through indirect means such as interacting with another application (e.g., the accounting system) or viewing a Web page, spreadsheet, or report. Log into www.SFDC-Secrets.com to see an example scenario. From the scenarios, the team needs to distill a set of system requirements. In many cases, the scenarios will have overlapping needs that are stated from different perspectives. A key step is to identify and consolidate the near-duplicate requirements, and to map them to the features provided by SFDC and related systems. For example, one sales scenario is to create a quote for an opportunity. This is fairly similar to the sales operations' scenario of updating a quote as well as to the sales manager's scenario of reviewing and approving a quote. All these scenarios are the requirement to edit opportunity, forecast, and quote information in real time (with the proper access controls to protect privileged information). This requirement maps to stock features in SFDC's Enterprise edition, but adds the requirement to integrate quote approval with the accounting system. It's a smart idea to create a correspondence table showing which scenarios need each requirement. Check out www.SFDC-secrets.com for an example of this kind of mapping. Many users (particularly executives) don't really think in terms of discrete requirements. Instead, they simply visualize what they need to make a decision or take an action. For this reason, it's a good idea to do mock-ups of a few reports, forms, approval screens, and dashboards (using Excel, PowerPoint, or even pen and paper) and do a "day in the life" walk-through of people's jobs to get them thinking. Creating these mock-ups can very rapidly elucidate hidden— and difficult—requirements. You'll be surprised how often a user will say, "Of course, I have to be able to see the customer's order history to make my decision . . ." To make sure you're being realistic, run through a couple of the exercises described in Chapter 2. Sometimes the requirements of different teams will slightly (or even thoroughly) contradict the stated goals of other departments. This is always dangerous to system credibility, so it's important to flag these contradictions right away. There's no way for the SFDC team to resolve mis-alignments or contradictions among goals: that has to be done by a meeting of the minds at an executive level. One side or the other will have to subordinate their objectives for the good of the whole. In addition to user-driven features, make sure to cover "taken for granted" system characteristics in your requirements documents: system availability (e.g., 7 A.M.–10 P.M. EST five days a week), system response times (1 second during operating hours), administrative response times (e.g., 1 hour during operating hours, 4 hours on weekends), thresholds for data error (e.g., zero defects in records A, B, and C, but 4% in all other records), international language support, multi-currency support, unusual fiscal periods, and other "environmental items" that you discover from your requirements gathering. In a large company with complex business processes, the scenarios and requirements will multiply quickly: their sheer number will soon be overwhelming. The best way to handle this issue is to create a short overview spreadsheet that organizes and summaries the requirements in a hierarchical fashion and helps the team visualize them from a "top-down" perspective. This highlevel spreadsheet should not provide the details of any one requirement, but rather should show how the requirements fit together to form the big picture of the project. (Check out www.SFDCsecrets. com for an example requirements overview spreadsheet.) The requirements spreadsheet needs to make it obvious to team members (and executives) the reasons why each line item is there, its scope, its schedule, its cost, its sponsor, and the line item(s) it could be traded off against. SalesLogistix is a trademark of SalesLogistix, Inc. All rights reserved. This work contains other companies' trademarks; when the publisher was aware of a trademark claim, the designations have been printed with initial capital letters. Those trademarks are the property of their owners. The author and publisher have taken care in the preparation of this book, but make no expressed or implied warranty of any kind and assume no responsibility for errors or omissions. The procedures and methods contained in this book are provided on a strictly "as-is" basis, and their use is entirely at the reader's own risk. The author and publisher will not be liable for any incidental, indirect, punitive, special, or consequential damages (such as data loss or system problems) in connection with or arising out of the use of the information, methods, or procedures described in this book. The author and publisher make no representations that the procedures or methods herein do not infringe on existing patents or proprietary rights of any third party, or that they will work in every system configuration. We hereby disclaim any obligation for indemnifying or otherwise compensating the reader.